Last year we announced XtremIO X2 which builds upon the incredibly successful X1 platform with its unique content-aware, metadata-centric architecture and integrated copy data management (iCDM) capabilities. X2 brings new levels of efficiency, agility and performance including: 25 percent on average better data reduction1; 80 percent better response times and support for up to 40 percent more concurrent users for VDI2; 2x faster3 VMware storage operations; and this does not even cover it all. 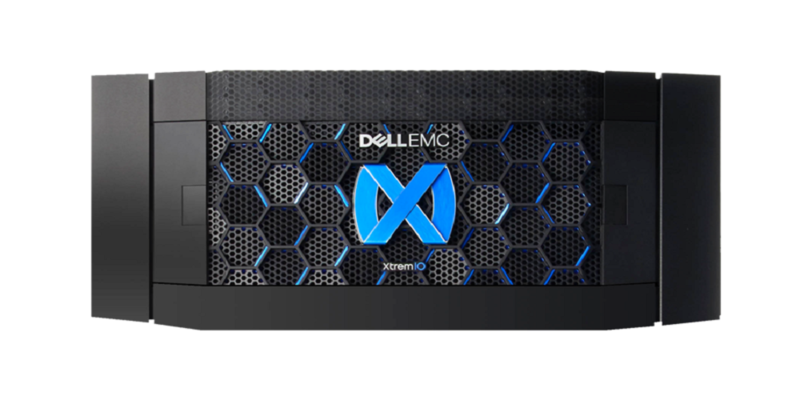 This year, we have expanded upon the enterprise capabilities of this market-leading purpose-built All-Flash array, announcing new features to make it possible for customers to experience the power of XtremIO at a price point never seen before. Data is at the core of all businesses. Fast access is essential for delivering services and remaining competitive. However, you don’t need to waste resources, time and bandwidth replicating data that you already have! 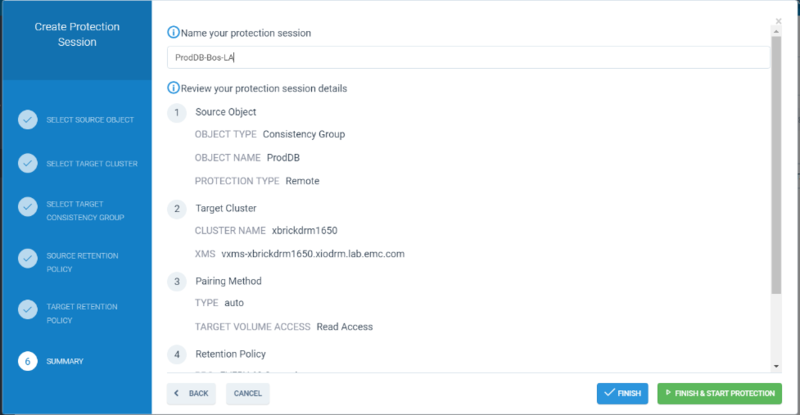 XIOS 6.1 introduces XtremIO metadata-aware replication, which is unlike anything else in the industry. It has been architected to only send compressed, unique data (after deduplication) to the remote site, minimizing WAN bandwidth. Duplicate blocks that already exist on the target site will never be transferred across the network. This highly efficient approach towards replication, along with zero trimming and write-folding, significantly reduces WAN bandwidth usage by up to 75 percent4. Additionally, this unique capability of X2 replication allows replication of heavy workloads without compromising RPOs. Let’s not forget the impact on the DR site. XtremIO replication also supports fan-in and fan-out configurations for different consistency groups to easily implement a central-site DR architecture. Primary sites are globally deduped against each other at the target site. With less data being replicated and a 4-to-1 fan-in architecture, overall storage capacity requirements (primary sites and target site) are reduced by up to 38 percent5. Those savings are in addition to compression and dedupe. 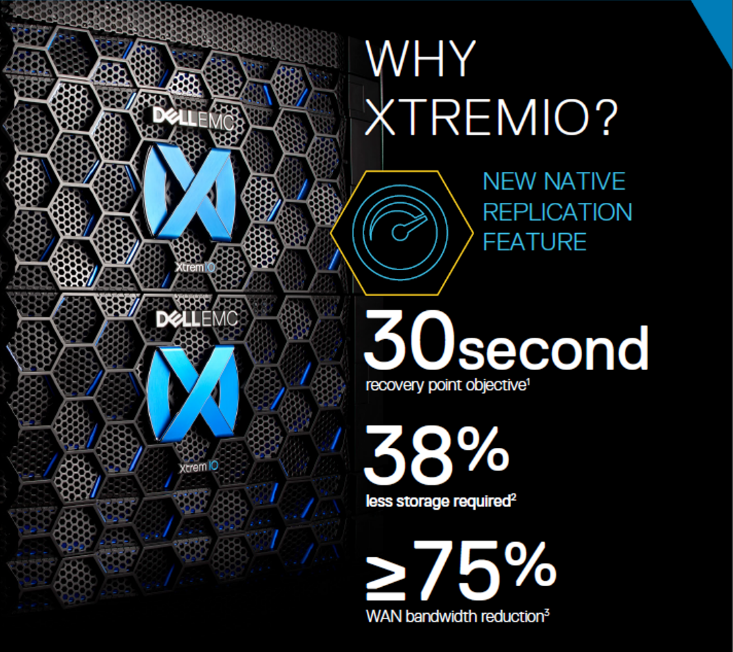 XtremIO replication offers operational simplicity by leveraging XtremIO’s unique in-memory snapshots (XVCs) delivering full operational recovery for disaster situations. Also, replication is configured with a new step-by-step protection wizard, simplifying management. The wizard walks administrators through the entire process, from setting up the source, target and setting up replication and retention policies (for minutes, hours and days). Then simply review and start protecting. It’s just that easy! X2 replication, like all other XtremIO data services, has minimal impact on overall system performance and response time. At no point is there a need to disable replication or any other data service in order to allow another data service to run. A new, lower-priced XtremIO X2 model has been added to the XtremIO family. Designed with XtremIO’s unique metadata-centric architecture with full data services including inline data reduction (in-memory space efficient copies, deduplication, and compression), and enterprise-grade availability, the new entry model X2 offers the enterprise capabilities companies demand starting at midrange prices. This model is perfect for customers requiring a single X-Brick with small capacity and limited growth plans but who still require high-performance with low latency. It scales from 34.5TB raw up to 69.1TB raw or 369TB effective capacity (6:1 storage efficiency). This model provides a 55 percent lower entry point for X2 versus X16. XtremIO X2 provides consistent high performance, incredible efficiency and more protection – now at a lower price point. But don’t take our word for it, hear what our customers have to say! You also won’t want to miss the new report in Storage Review report about XtremIO’s new native replication capabilities. Be sure to check out the below links and then follow us @DellEMCStorage on Twitter for the latest and greatest on XtremIO. Source 1: Based on Dell EMC internal analysis, February 2017, compared to the previous generation XtremIO X1. Source 2: Based on Dell EMC internal testing in February 2017 using the LOGINVSI benchmark test to compare to the previous generation XtremIO X1. Actual performance will vary. Source 3: Based on Dell EMC internal analysis, February 2017, compared to the previous generation XtremIO X1. Source 5: Based on Dell EMC internal analysis, February 2018, with XtremIO Replication for fan-in 4:1 central DR site topology.